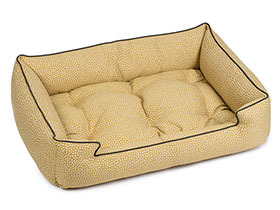 A cozy sofa like bed, the Jax & Bones Sleeper Dog Bed is sure to provide a good night's sleep for any dog. Bolstered sides unzip and the cover is easy to machine wash. Conviniently the tufted center pillow can be washed as a complete piece. The fill inside the bolsters and in the mat is "Sustainafill", a proprietary allergy-free eco-friendly fiber filling made by Jax and Bones.